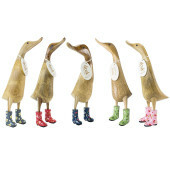 Natural Finish Ducklet with Blue Floral Welly Boots, standing approximately 30cm high. 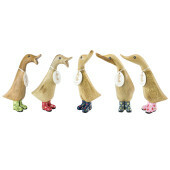 Natural Finish Ducklet with Blue Floral Welly Boots, standing approximately 22cm high. 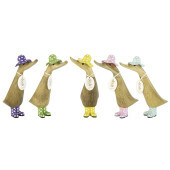 Natural Finish Duckling dressed in a pink spotty hat and matching welly boots – standing approximately 18cm high. Natural Finish Duckling with Blue Floral Welly Boots, standing approximately 18cm high.